The mother, with her new born twins and an attendant, were instantaneously put into the aircraft and flown out to safety with due care. RAJKOT: The Indian Air Force safely evacuated a woman, her new-born twins and another pregnant woman from Nana Matra village in Vinchia tehsil of Rajkot district of Gujarat, which was flooded due to heavy rains. Acting with lightening speed, an Indian Air Force Chetak helicopter got airborne within minutes of the IAF receiving a request for immediate evacuation the two women in critical condition. The message with the location details was received at 4: 30 pm and the Chetak got airborne from Jamnagar at 4:40 pm heading for the site. 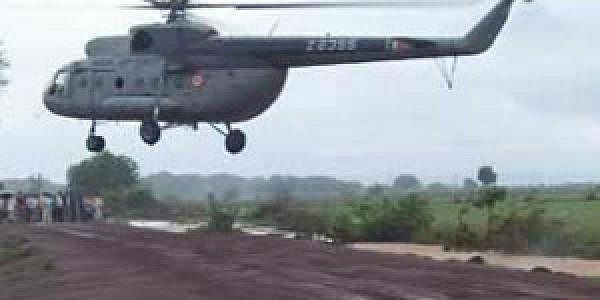 It took barely any time for the seasoned heads and hands at work at HQ SWAC Gandhinagar coordinating Human Assistance and Disaster Relief operations in the area in choosing a Chetak helicopter for this particular operation - owing to its much lesser All up Weight as compared to a MI-17V5. Keeping in view - the medical condition of those to be evacuated, the aircraft would need to land to take them on board safely (in all probability on a patch of soft ground as reported by district officials at the site). While the aircraft was en route to Nana Matra Village of Vinchia Taluka in Rajkot district - the district administration officials informed that one of the two women to be evacuated had already delivered a set of twins and needed to be airlifted immediately. By 5: 15 pm the 'Saviour Chetak' was already overhead looking for a safe patch to land. The mother, with her new born twins and an attendant, were instantaneously put into the aircraft and flown out to safety with due care. The aircraft landed at Jasdan helipad where they were handed over to the medical team already waiting for the aircraft on ground. The aircraft then returned to Nana Matra, this time packing up another pregnant woman bleeding profusely, in need of urgent medical attention. The lady along with an attendant was quickly evacuated and flown across the river where the medical staff and ambulance in wait took over.